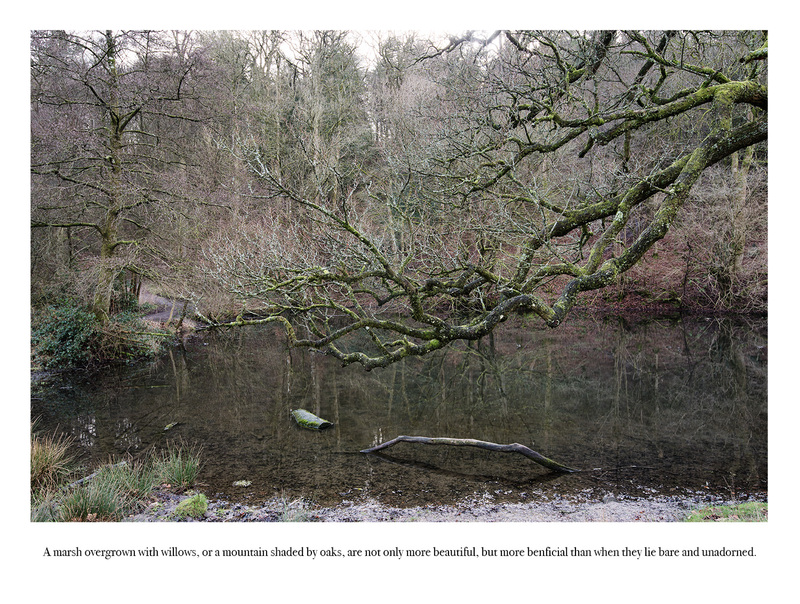 I have reworked assignment 1 following my tutor’s comments that the pictures needed to be presented more effectively to allow a better understanding of my intentions. 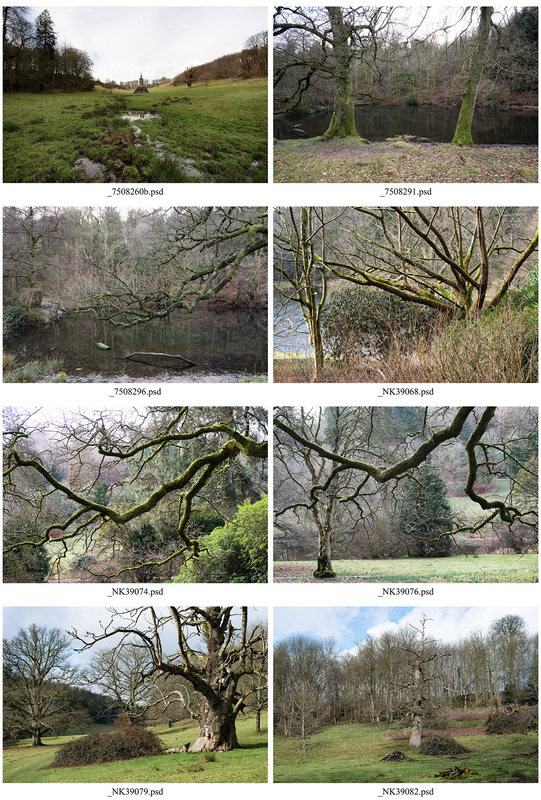 The rework returns to Joseph Addison’s 1712 essay (3) that described the new thinking that led to the English landscape garden movement in the eighteenth century. As noted elsewhere this essay includes the first known use of the word landskip or landscape to describe land as opposed to a painting of land (ii) so Addison not only documents what would become the agenda for English gardening for the next fifty years he presaged the term landscape garden and established the distinction between land and landscape. I have selected parts of that essay as captions but have placed the captions on the image rather than using the caption function in WordPress. This stops WordPress adding a frame and links the text more closely with the photograph, it also means the viewer will generally need to open the image to read the text. I have resequenced the images with the intent of there being a flow of both picture and text. The original supporting text is included below the last picture. 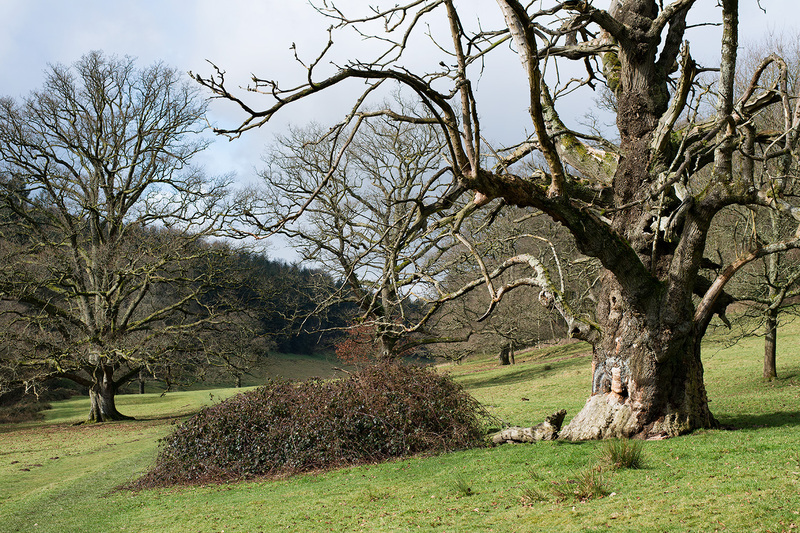 In 1724 Henry Hoare II, known to the Hoare family as Henry the “Magnificent”, inherited Stourhead which had been acquired by his father in 1717 for the princely sum of £14,000 (1: p.5). As well as acquiring the rather run-down Wiltshire estate at the tender age of nineteen he became the owner of Hoare’s Bank and for the next twenty odd years his focus was primarily in the city of London but between 1738 and 1741 he took a belated gap year, or three, and embarked on the Grand Tour spending much of his time in Italy. We can assume that like many of his generation he returned inspired by the Italian landscape, classical architecture and the paintings of the Romantic artists (i). 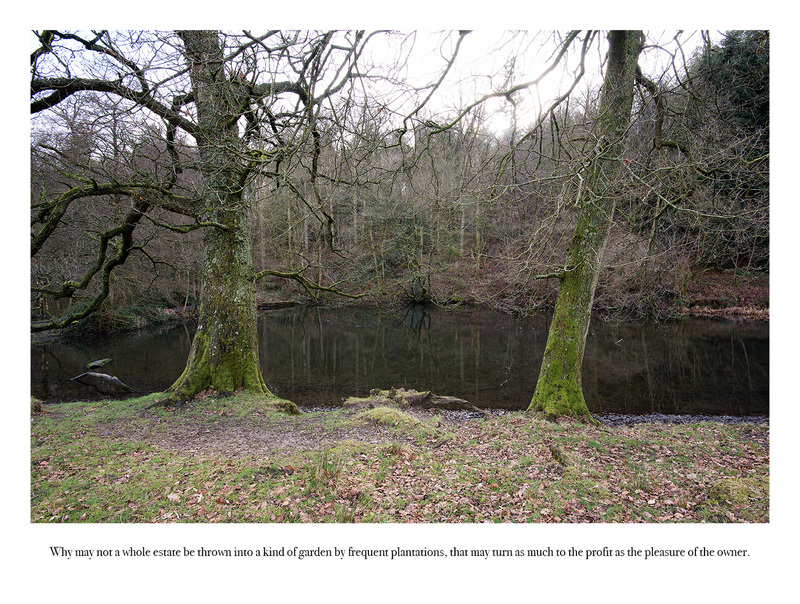 This is the first known use of the word landskip or landscape to describe land as opposed to a painting of land (ii) so in his essay Addison not only documents what would become the agenda for English gardening for the next fifty years he presaged the term landscape garden and established the distinction between land and landscape. I have spent much of the last two months gaining an understanding of landscape photography’s roots in landscape painting; I also followed a thread from that same source that took me into the development of the English landscape garden. 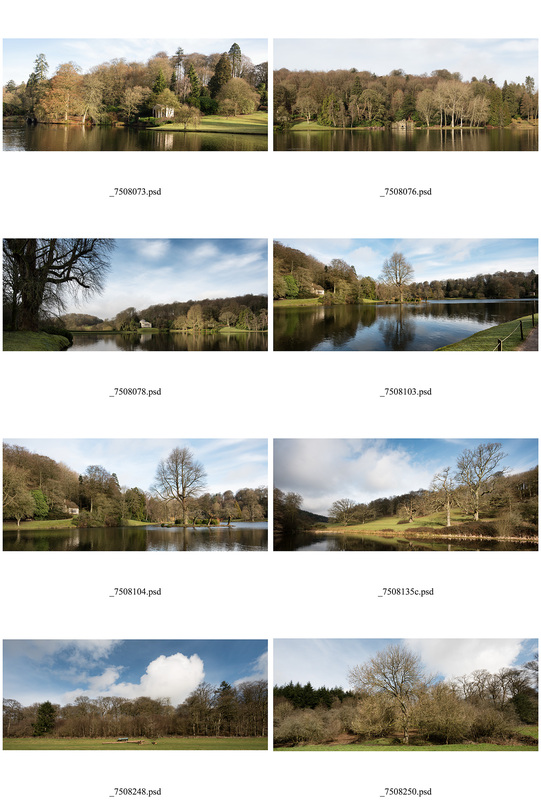 So, when asked to produce a series that conveys my “interpretation of beauty and/or the sublime within the context of landscape” it seemed a natural progression to choose Stourhead as the site for this project. A place that neatly brings those threads back together. 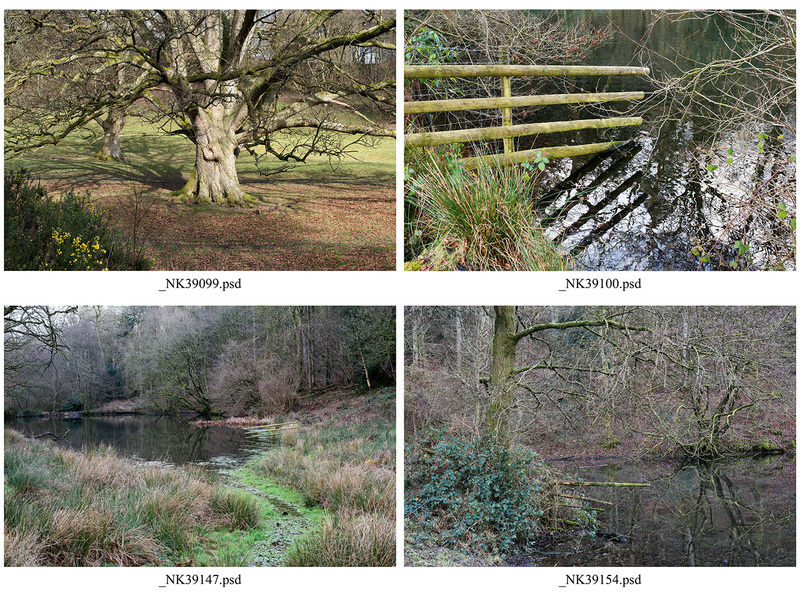 As previously discussed (here) the visible surface of the British landscape is man-made, there is no primordial forest or untamed wilderness here, we have exploited and moulded the land to create our habitat, agriculture, industry and transport arteries. But, however hard we try to suppress or tame nature it pushes back; seeds, grows, spreads, withers, dies, rots and feeds itself again, an ever repeating cycle that invades any space we ignore. Nature is chaotic, it has no aesthetic gene, it creeps, clings, thrusts, tangles, burrows and shoots in any direction it can as plants compete for light and nutrients; it strives to reclaim the land, to reinstate the dark and endless forests that once clothed Britain. 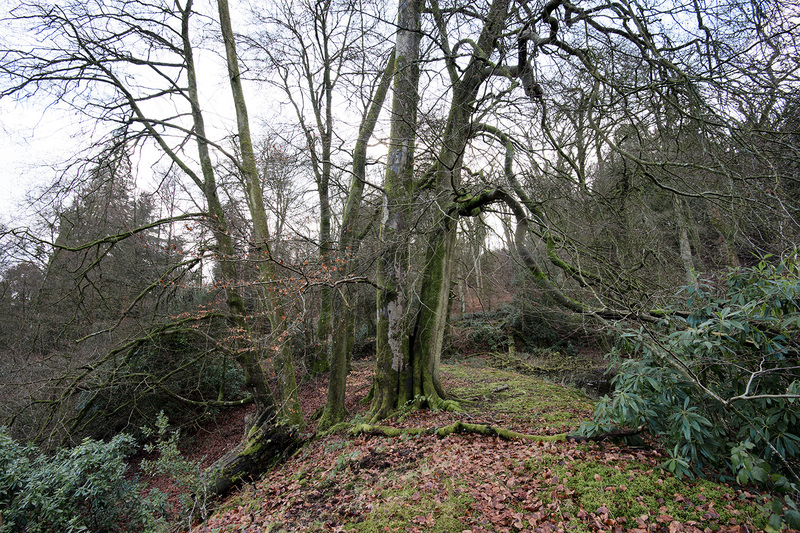 Our distant ancestors began to push back the forest edge; until the Roman occupation of Britain and the development of towns people lived in cleared spaces of varying sizes that would have had the forest’s fringe in view. The edge land where forest and open spaces met would have been a familiar place, where order became chaos, light became dark, known became unknown; the place where myths began. 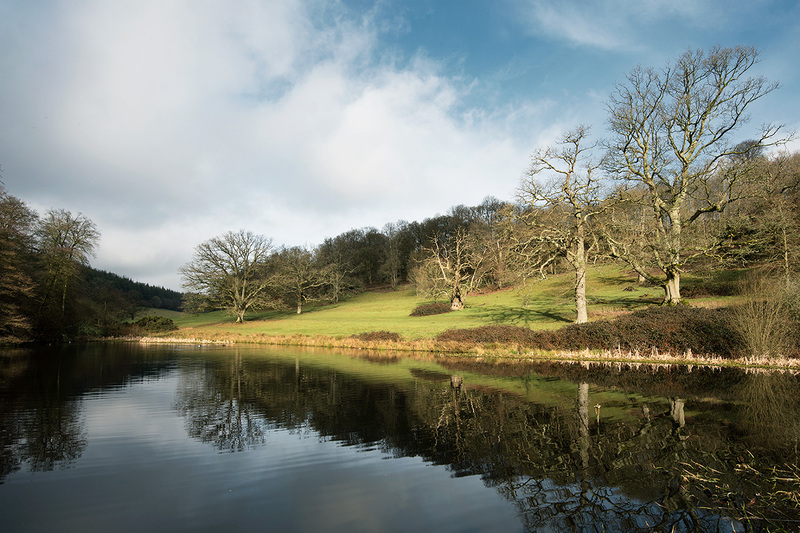 I am intrigued by the great pioneering landscape gardeners, the ones before Capability Brown, the landowners who saw themselves as painters of the land, who created art by organising nature on a monumental scale. Their concept has passed the test of time but the gardens at Stourhead, Stowe or Castle Howard are not what Hoare and his contemporaries designed. They have moved on, new planting has been undertaken, new buildings constructed and some saplings have become mighty whilst many have long since died. But it struck me that around the edges, where landscaped garden meets natural forest, perhaps little has changed; nature creeps back, crossing the margins of the manicured land, natural water courses reaffirm their rights to ancient routes across the designed spaces, significant components of the original design become diseased and die and dying is an untidy business. I approached Stourhead, “the quintessential landscape garden” (2: loc.6423), to explore this margin between that most tamed land, the garden, the beautiful, picturesque country garden coiffured by a thousand gardeners for three centuries, and the sublime natural energy that waits in the shadowy margins for an opening to exploit, an opportunity to subvert their designs. (ii) Landskip was term derived from the Dutch word landschap or land shape in English. Robinson states that, prior to Addison’s essay, it had been used “exclusively to describe landscape paintings” (2: p.2084). You present a thorough and exhaustive exploration for this first assignment. The body of work is well referenced and analysed within its historical, social and political context. There is a a good mix of cultural analysis interspersed with personal experience/opinion, that makes for interesting reading. If may be so bold I feel there are some areas that are overlooked in your analysis, which I will outline below, however there is the word count to consider and it’s a weighty tome already! Excellent work Steve. 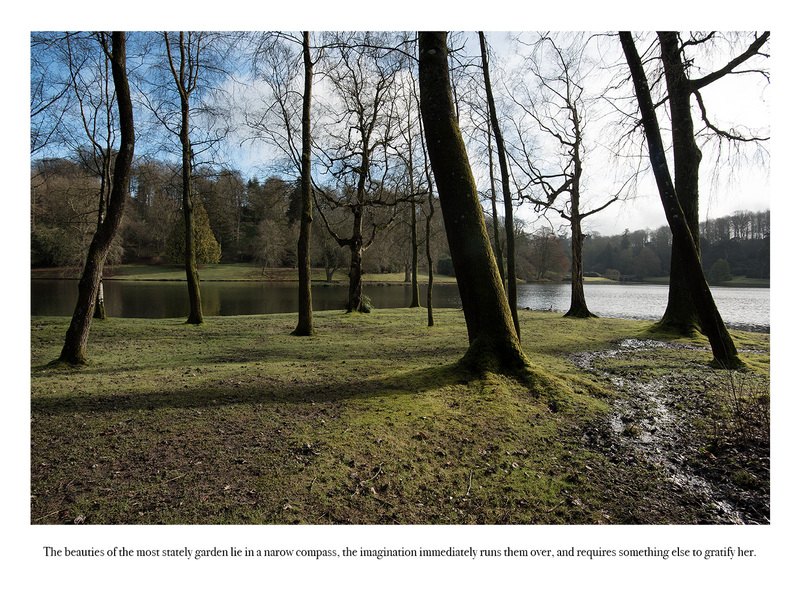 A well thought out and considered set of images that explore the margins of the manicured edge lands at Stourhead. The concept works well and you investigate the areas to good effect using different framing devices to draw the viewer into a variety of scenes. Depending on your particular interest (history/geology/botony) I think there’s much here to enjoy. It’s hard however to assess the success of the images on the screen. Presented as they are currently I only really understand your intentions after reading the accompanying text. To really push the practical work up to the level of the written work my feeling is that the final images need greater thought in their presentation. What are your thoughts on presenting the work for assessment? My feeling is that it would improve the quality of outcome were you to give more thought to the titling and sequencing of the images. For example something to physically locate the image to a marginal location? A grid reference?(ref. M Power/A-Z), a map? (ref. Hidden Islam), fold out pages? Referencing a map as per Mark Power Twenty Six Different Endings / The Shipping Forecast. Power explains that “I can only make sense of a place if I see it pictured in two-dimensions” (1) I share this interest in maps, being also unable to venture into an unknown space without first studying the topography in two dimensions. Incorporating a map or maps into the presentation of the work as per Nicoló Degiorgis’ Hidden Islam. 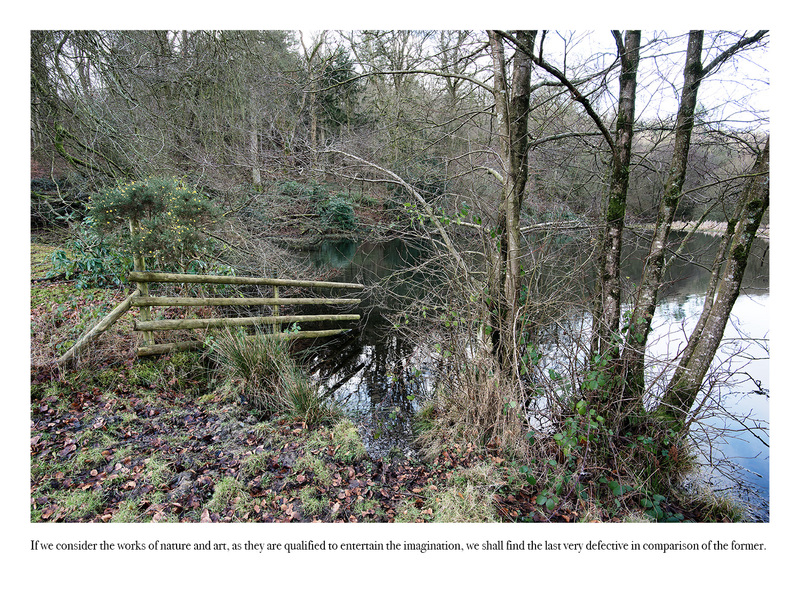 Some of the images work better than others in depicting the contrast between the ‘landscaped’ and the wild/overgrown. I can see that you are trying to balance the set and not repeat the motif too much here, I enjoy the nuances within the work but I think the contrast could be made more explicit in some of the images. I take the point but I wasn’t necessarily looking for direct or obvious contrast between the ‘landscaped’ and the ‘wild/overgrown’. 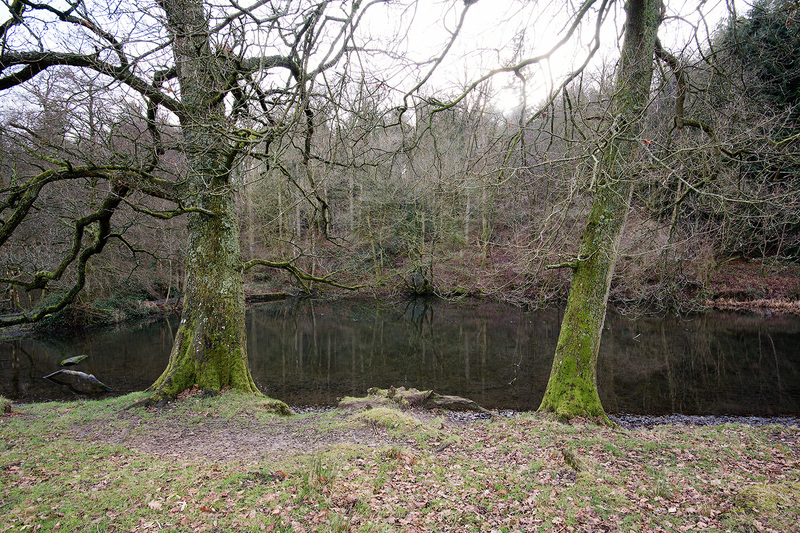 For example the ponds that appear in many of the images are man-made; it is not clear whether they were created by Henry Hoare as part of his landscaping or whether they have been formed for agricultural or industrial purposes at an earlier time and the dead or dying tree might be part of Hoare’s original planting. I wanted to maintain a certain level of ambiguity and subtlety in the series rather than just comparing the obvious ‘garden’ to the obvious ‘wilderness’. It would be nice to see the accompanying contact sheets for the next assignment. 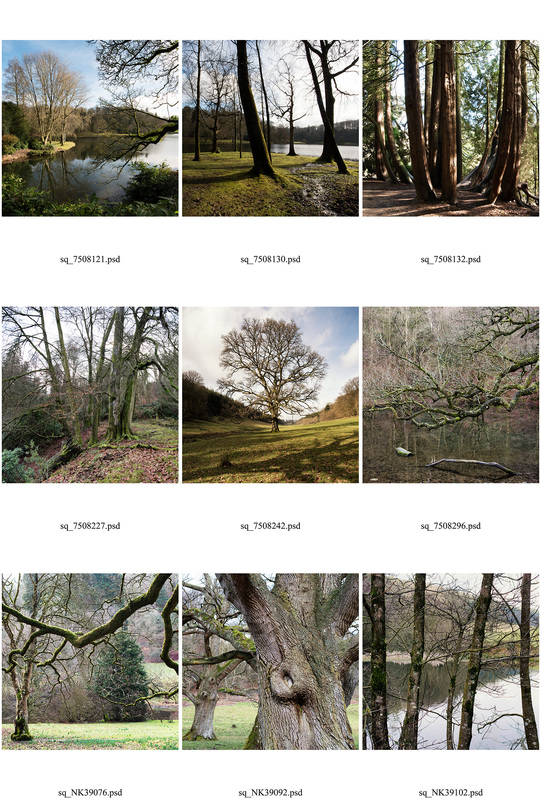 I will include contact sheets going forward and have added one to my blog for this assignment as a point of reference (here). I like the way you have used the language of ‘A pretty Landskip of his own possessions’ I wonder if something of this word play could be brought into the title of each image, adding a further level to the reading of this image. You have done so much in the way of research I think the presentation of the final images would do well to reflect this and inform the reader in a more immediate way of some of the background reading you have undertaken. A good idea as mentioned above. You make some excellent points within the projects/exercises accompanying this assignment, especially in relation to the fluidity of context in which we view the work of photographers. Thoroughly researched and well referenced throughout, you fulfil the brief and go beyond it in most cases. I’d say watch the word count, but as there isn’t one for the exercises/projects and it is all so fascinating it can be hard to trim it down. For the most part you keep to the main point with very little wondering. These exercises are really for your benefit/wider research and it’s good to see you engaging so thoroughly with them. I am pleased that my tutor hasn’t come down too hard on me for including such long essays. The subjects I have looked at are so broad in scope that it was highly challenging to find a succinct path through them. I’m not sure of the comparison with the Camel Estuary/Simon Roberts as an example of the Pastoral which I have always associated with the rural landscape – what were your thoughts here? The Oxford dictionary defines pastoral as “(of a work of art) portraying or evoking country life, typically in a romanticized or idealized form.” and I see this idea as being at the heart of We English. He looks at the English countryside as an amenity, a place to visit and pursue “healthy activities”, to camp, walk, picnic, sight-see, sledge, fish, play sport or holiday; he selects quintessential English landscapes as the site of these activities and in doing so creates idyllic scenes that are as much romanticised as any photograph of a shepherd and his flock. 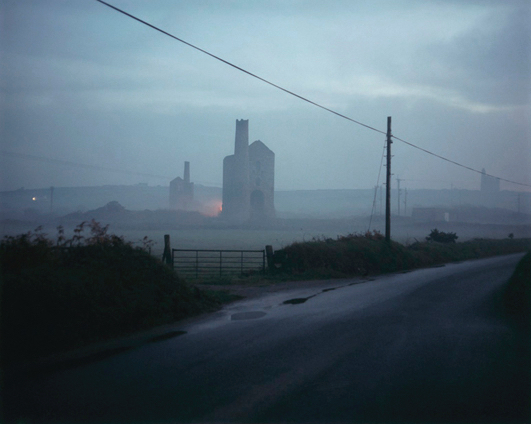 If we remove the day-trippers from his photographs we see an industrial or agricultural landscape that has been exploited and modified by humans as an economic resource (maybe the beaches are an exception). The countryside wears these two hats – an idyllic amenity overlaying an economic resource with the former representing, if not wealth, at least disposable income, and the latter potentially representing the struggle of rural industries and communities. However, You didn’t draw a picture but used an existing image. I note your discussion with a peer at the bottom of the post where you state your reason for doing so but I’m wondering why the reluctance, the idea is to free yourself up from the technicalities of holding a camera – let go! Comprehensive presentation of research throughout the learning log. An exhaustive, but relevant, amount of written work which is fully referenced. Use of hyperlinks to link back to previous work, used to good effect, adding depth to written text and demonstrating prior learning/engagement. Thorough analysis of course materials and other relevant sources, drawing well rounded conclusions, interspersed with personal experience/point of view. Uses a wide range of reading/external sources to make links between the contemporary and the historic. Engages in peer to peer feedback/dialogue, good to see debate and reflection within projects and exercises. A different perspective – this is probably outside of this assignment brief and will be covered later in the course, but I can’t resist! You have covered so much already within this assignment but I feel there is something missing from the discussion at this level – women and their experience of the landscape. Landscape can be so (historically) dominated by a white male view that we can become blind to the experience of others who have had their view restricted within art history. It’s all too easy to carry a version of history and the language of that history forward if we don’t apply a different lens to our contemporary critique. 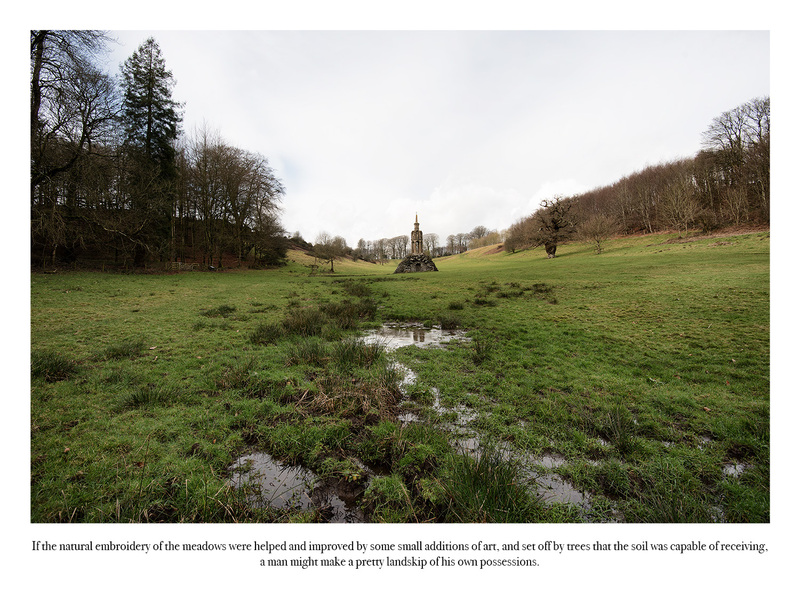 The use of the title – A Pretty Landskip of His Own Possessions, is a case in point about ownership, power and control which the landscape comes to symbolise. I know I have suggested good old Liz Wells before, but I really can’t stress enough how much I think she succinctly locates the British landscape within it’s cultural context. 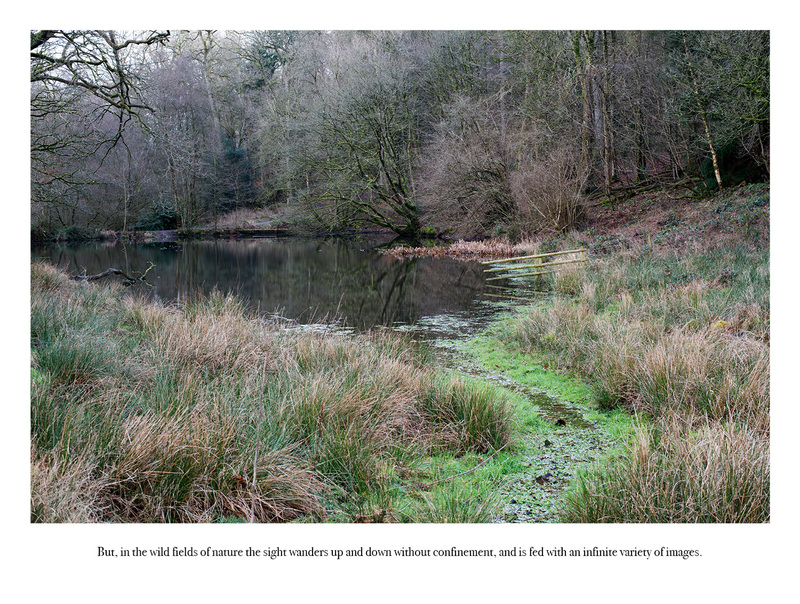 Have you read the chapter on the female gaze/experience of the landscape? I think this is an area for you to consider and broaden out from, an intersectional feminist critique of the British landscape. Who is missing from the view? Who is included/excluded from the landscape. This can be broadened out to include many other views/lenses including the colonial, racial, national identity, and all the points where any of these views/experiences inter-sect. Following an email conversation with my tutor I will digress a little at this point and consider the role of race and gender in landscape art. 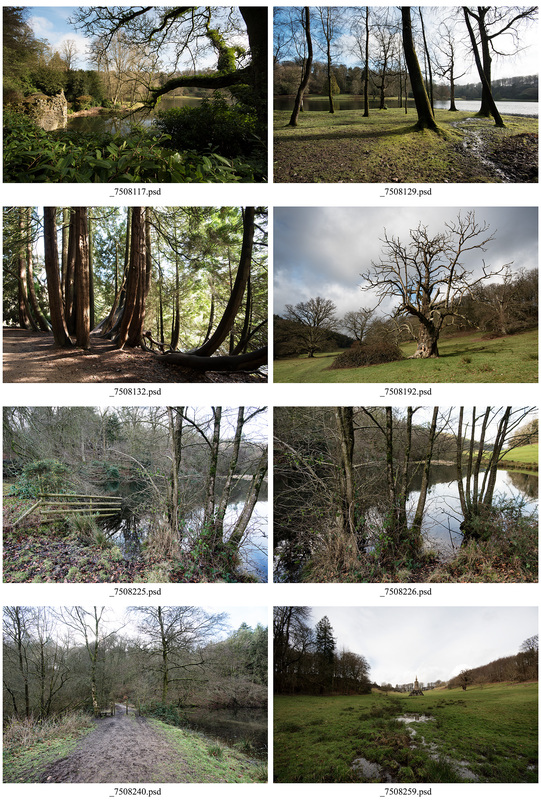 There were three distinct sets of edited images that I considered developing for assignment 1. Wide aspect landscape photographs whilst not common are often used to good effect. Josef Koudelka’s Wall (2) comes to mind where the seemingly omnipresent Israeli “security fence” is made more oppressive and full of foreboding by his panoramic viewpoint. David Anthony Hall (3) whose main subject matter is trees, uses panoramas to provide a sense of scale and the patterns of the forest. In the early part of the shoot when the light was supportive of the idea of capturing picturesque views I took a number of shots that I thought would lend themselves to a 2.35:1 aspect ratio. 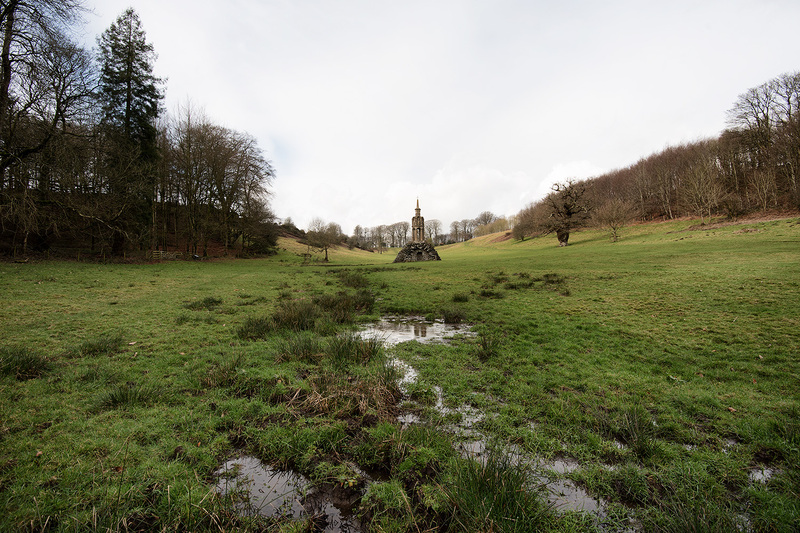 If picturesque had been my intent for the project these type of views might have been a starting point for an exploration of the landscaped spaces of Stourhead but they tell us nothing new or interesting about the site. 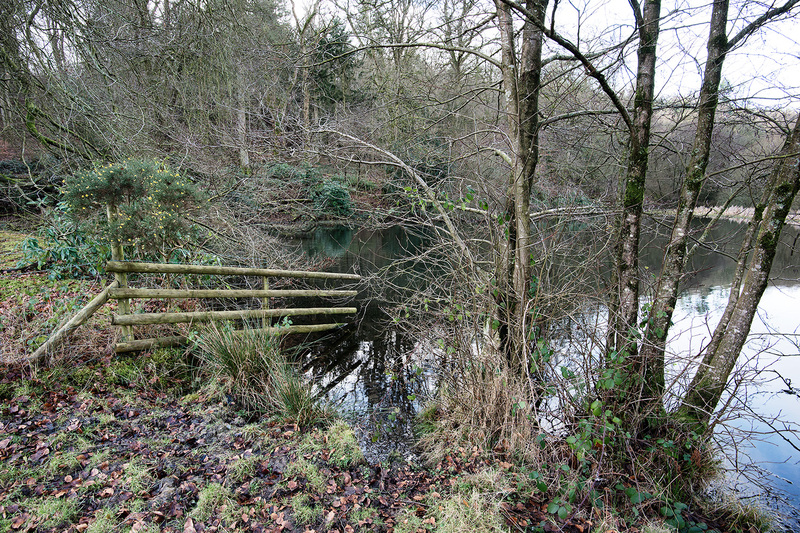 As the shoot developed I became more interested in the margins between the landscaped garden and the more natural woodland that surrounds it and began to focus on places where nature was attempting to restore the natural order of things. In post production I cropped a number of these pictures as squares, again thinking about ways to subvert the conventional landscape aesthetic. 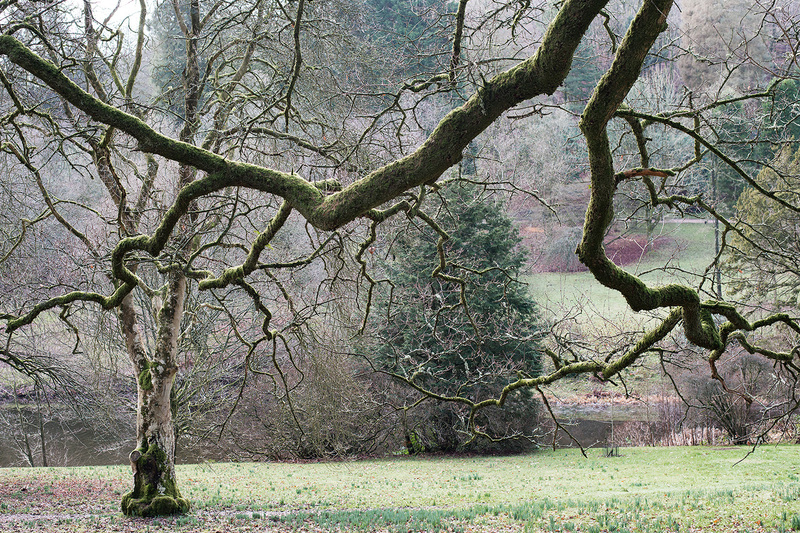 The square aspect tightly frames the landscape and works especially well for studies of woodland. Fay Godwin regularly but not exclusively worked in this format (4 & 5) as did Bill Brandt (6) and it is most commonly associated with medium format 6×6 cameras. I think I could have developed a series based on these square crops but I had not been photographing with that idea in mind and too many of the edited shots felt contrived. Giving up all hope of subversion I settled for a very traditional 4:3 aspect ratio for my short list. (i) Many panoramic or wide screen aspect ratios are borrowed from cinema; the traditional Academy ratio of 1:375:1, Cinemascope at 2.35:1 or the accepted TV format of 16:9. As the most panoramic crop I have used 2.35:1 on several occasions. (2) Koudelka, Josef. (2014) Wall: Israeli and Palestinian Lanscape 2008 – 2012. New York: Aperture. The series references a number of photographers. The original idea to take on the challenge of photographing the landscape through the branches of trees came from, to me, the quite surprising source of Lee Friedlander. 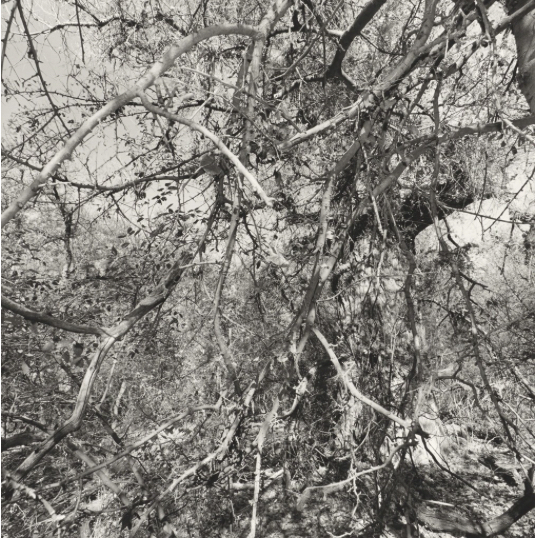 His recently published book, Western Landscapes (1) contains a number of photographs where the foreground is dominated by unruly tangles of bare branches. They are enigmatic but strangely alluring, a sense of peeping out through the undergrowth, often at the majestic Western landscape. It was Friedlander’s friend and contemporary Garry Winogrand who said “I have a burning desire to see what things look like photographed by me” and I wonder whether this also part of Friedlander’s motive. 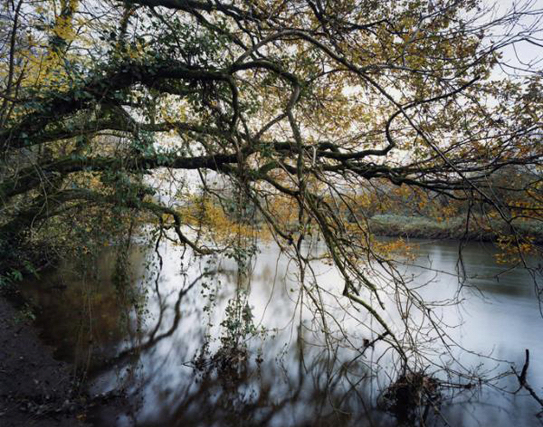 Once the idea was implanted I looked carefully at Jem Southam. Unfortunately I do not own a copy of The Painter’s Pool but have reviewed many of the pictures on line and particularly enjoyed his interview with Andrew Nadolski where he explained why he had embarked on that project. I was taken by the idea that one of Britain’s best known landscape photographers would set himself such a direct challenge and whilst I had no expectations of achieving the same results I felt that to photograph similar environments would help me develop my practice. I do have copies of The Red River (3) and River Winter (4) (my review is written up here) and, as might be expected, Southam’s approach to winter, river, untamed nature and the intervention of man were all influential. 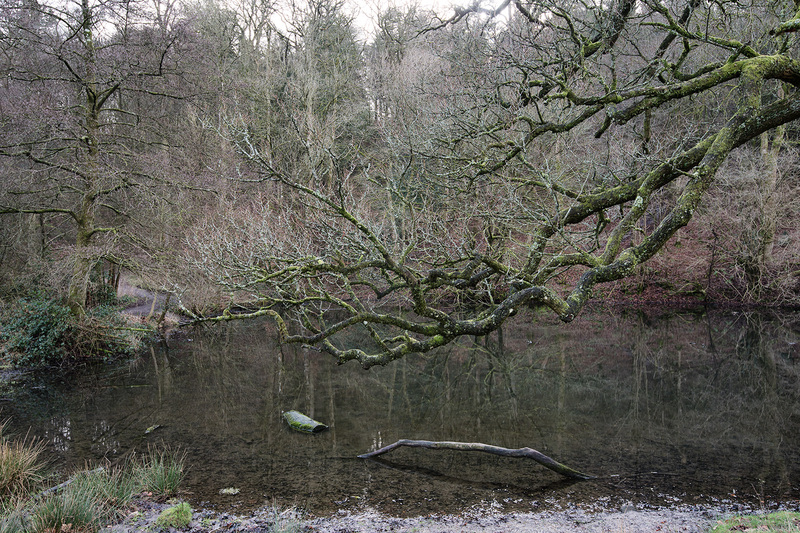 Also, and very importantly, Southam’s work is imbued with a deep sense of the history of the land, a subject that directs a lot of my work and that played a significant part in my project for assignment 1. 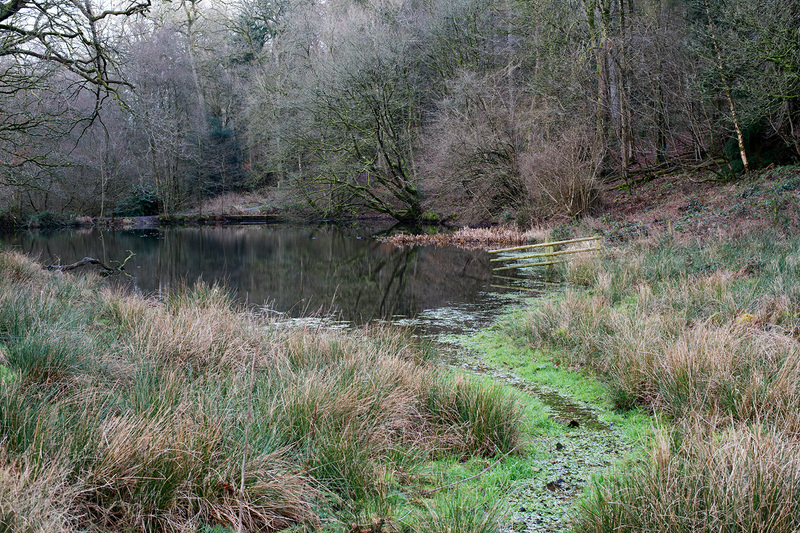 Damian Ward is an English landscape photographer working mostly in the Chilterns. 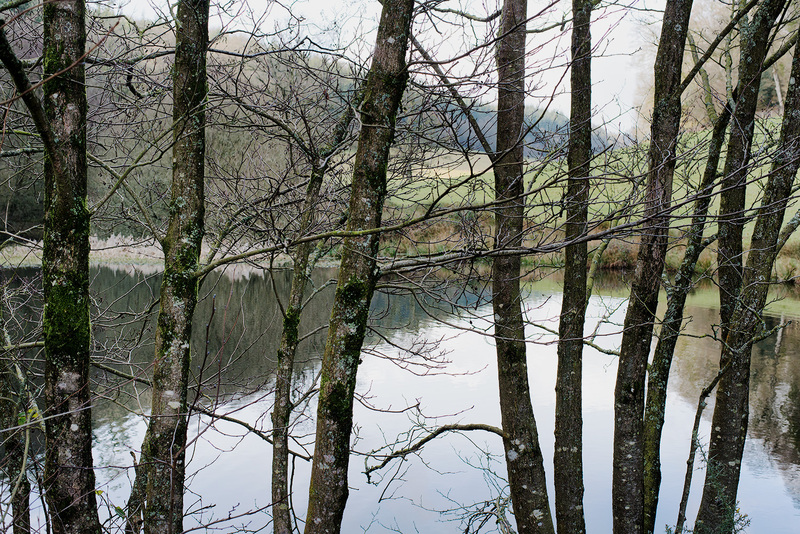 Like Southam he appears to have invested a significant amount of time in a single landscape, an approach which allows the photographer to seek out the essence of that land. Woodwork (5) is a series taken in or on the fringes of forest and I found Ward’s use of colour to differentiate the detail of these seemingly chaotic spaces particularly interesting. David Baker is a Southampton based photography who has often worked in the New Forest. 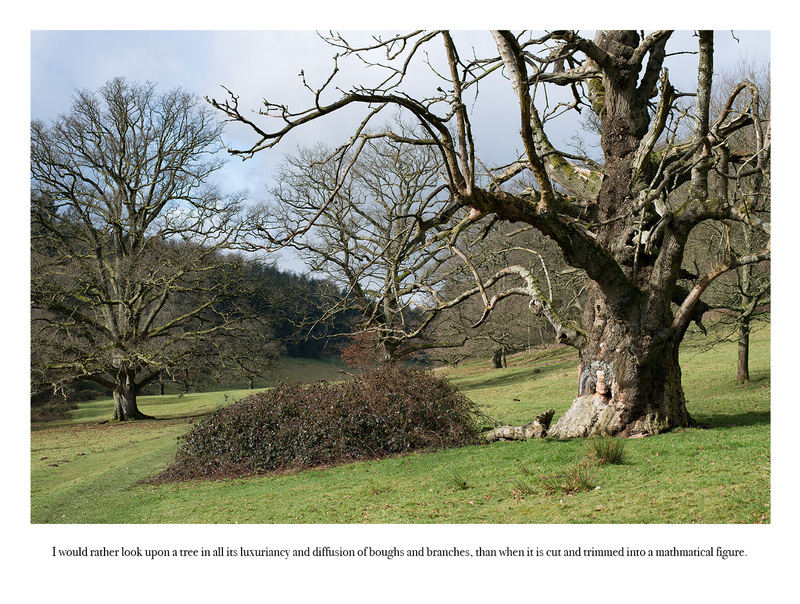 Ridge Trees (6) is another series published by Kozu Books that exclusively focuses on trees. 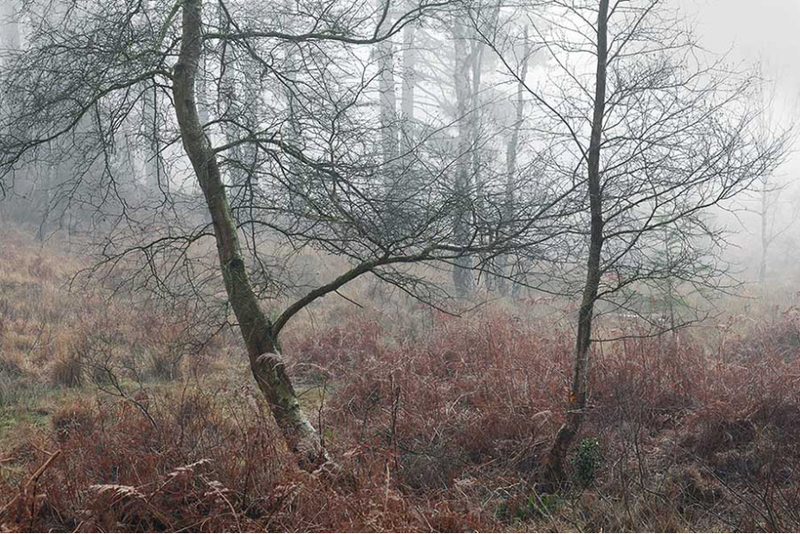 Baker’s work is an interesting mixture of work that speaks to the “fine art” photography market and sensitive studies of the atmosphere of deep woodland. 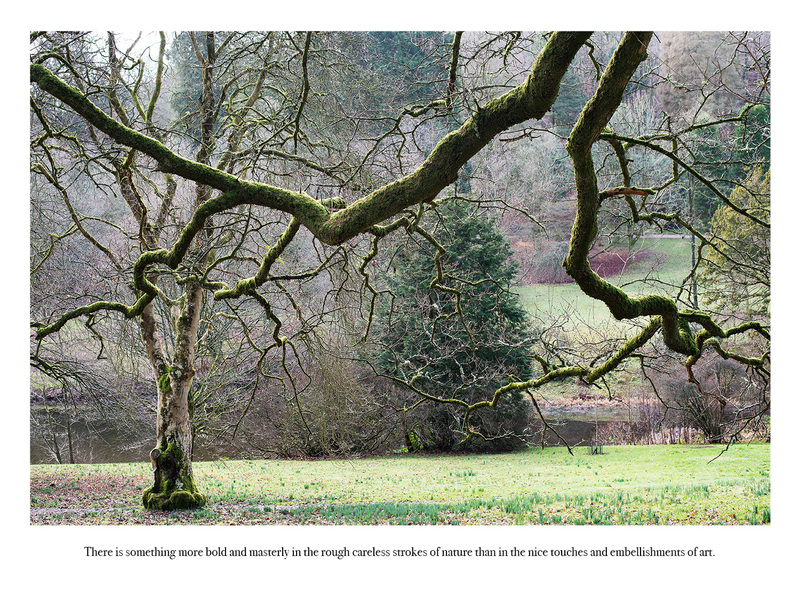 When working inside the forest the photograph can never include the “whole” it is always a component, a detail, that is selected and I found his compositions of parts of trees particularly helpful in moving me away from attempting to frame too large a scene. (1) Friedlander, Lee (2016) Western Landscapes. New Haven: Yale University Art Gallery. Following feedback both here and on the OCA Discussion Forum I have made several changes to my provisional series for assignment 1. Whilst a number of critiques were positive about the geometry of the winter branches the series was rather one dimensional. The most significant change is therefore the inclusion of some different perspectives of the same land. 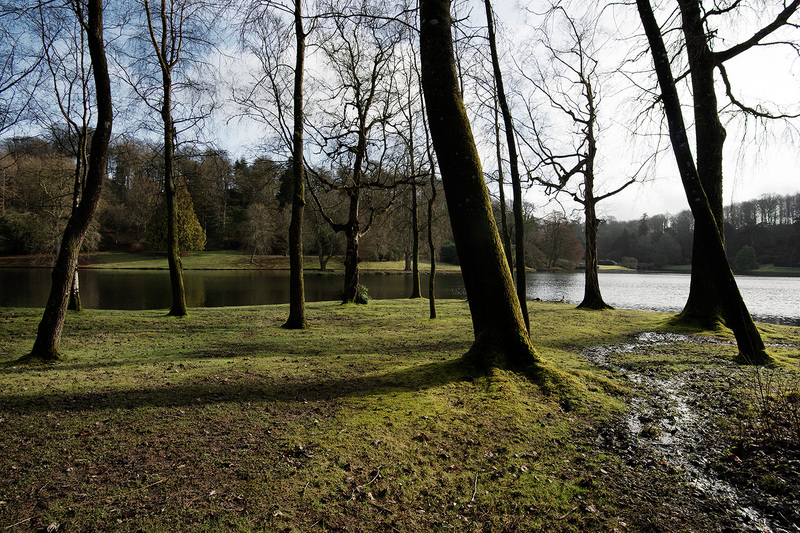 Landscape assignment 1 asks us to convey our interpretation of beauty and/or the sublime and I selected Stourhead as the site for this series as it is recognised as one of Britains greatest landscape gardens and in that sense a landscape specifically designed to be picturesque. I was interested in how effectively its eighteenth century designer and its latter-day guardians had been successful in keeping nature inside the bounds of their preconceived notion of the beautiful. I wanted to look the “other way” where nature was pushing back into the man-made landscape and reinstating its natural and chaotic state. It is a study of the edgelands that surround and at times have invaded a groomed, stylised, idyllic landscape. The final submitted series will be accompanied by a 500 word supporting text but at this stage I would appreciate any feedback you might have. Landscape photography is a broad church and when compared with the other main genres of photography it is perhaps the one that comes with the most historical baggage. I have discussed at some length its roots in landscape painting (here) but beyond that historic context the conventions of painting in terms of subject matter: the picturesque, pastural, grandeur and sublimity to name but a few, and in terms of composition continue to dominate contemporary, popular landscape photography. Following an approach promoted by most of the photographic press, how-to books, photography clubs and websites many photographers have perfected the representation of a perfectly lit, picturesque view of pastural, coastal or wild Britain. I admire the results, recognise their technical expertise, respect their dedication and admit, particularly in my medium format days, to searching out the reflection of mountains in dark lakes, autumn colours on misty mornings and idyllic rural scenes. In terms of aesthetics there is little wrong with the best of such work, the picturesque is popular because most of us take pleasure from beautiful scenery but it is often more pop than jazz, alluring, technically perfect and formally composed; however, only the most exceptional piece passes the test of time, whereas jazz offers multiple levels of complexity that draws us back time and again to explore it more deeply. There are two main problems with popular, picturesque landscape photography; firstly the pictures are often presented as single images or collections linked only by broad geographical categories as opposed to series that develop conceptual themes. This reduces the images to scenic snapshots that concentrate attention on the visible, superficial characteristics of the land; the eye-catching reflections disguise the dark waters of the lake, the striking autumn colours camouflage the forest. The second problem is that the search for an ideal viewpoint and perfect light tends to idealise the land, promoting a rural idyll that advertises rather than investigates the countryside. The nature of the advertisement may, as previously discussed (here), have some similarity to the early photographers of the American West by presenting the landscape as real estate, a place to invest, exploit or settle. Alternatively, and harking back to the picturesque painters of the eighteenth century or Ansel Adams in the American National Parks, it can promote the land as a tourist amenity, a place to visit, a view to find or even, in the age of social media, to capture as a trophy photograph. 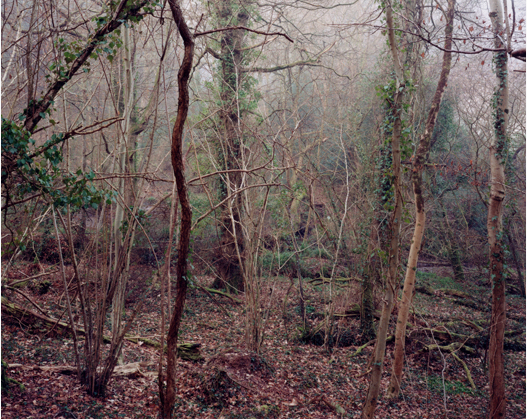 This background history is fundamental to understanding Southam’s photographs which chart the complete cycle of the valley’s geological origins, the rise and demise of the primordial forest, its long period as a pastoral idyll, the ravaging of the land by mining and industrial processes through to industrial decline and the area’s subsequent reinvention as a recreational amenity. The sweeping scale of this series is breathtaking, few photographers have attempted to record such a monumental passage of time and all in less than fifty photographs. The passage of time is matched by the diversity of the pictures. He uses natural rock formations and old farm buildings to describe the black rock at the source of the valley; wooded valleys, and detailed studies of lichen loaded branches to represent the primordial – a hint of what is to come in his much later The River Winter series. 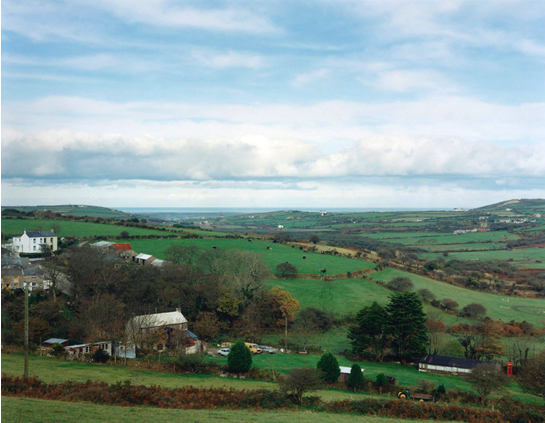 For pastoral idyll he offers a careful judged mixture of broad landscape and telling details, contrasting the lush pastures of Bolenowe with the grey stone farms that speak of hard places, marooned amid brooding hills and muddy yards that starkly contrast the image of Cornwalls’ rivera with its quaint fishing villages and boutique hotels. The sequencing of the series takes us from the sublime high moors, into the dark forest, cleared to create the wide open spaces of farming that were then invaded by the santanic mills of industry and below the surface into Tolkien-like tunnels carved through the rich red rock in search of minerals. Following the trajectory of the locations our emotions move ever downwards before he lifts the mood with new farms, bright gardens and tourist beaches. 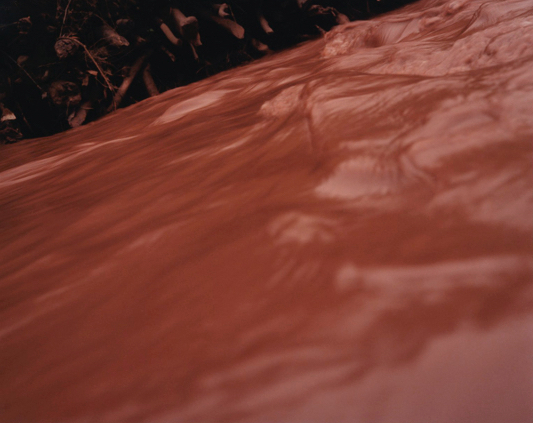 Few photographers master the art of narrative, the medium mitigates against easy story telling; Red River is a sophisticated, complex but ultimately successful narrative because it demands our close attention; asking us to recognise the rhythms created by his changes in perspective, from close shot to broad vistas and his use of colour to juxtapose old with new, nature with industrial debris and life with death. There is a honest reality about the Red River, it is not the Cornwall of postcards, Doc Martin and yellow, cream-rich, ice cream. It is initially melancholy, history weighs heavily on the first two thirds of the series; a deforested landscape, failed industry, struggling farms, dilapidated buildings and a land scarred by man’s exploitation but towards the end it contains a strong narrative of rebirth and reinvention. In a series that excludes any human subjects we find the story of man’s interaction with the land and a community that has consistently found new ways to survive in this valley. 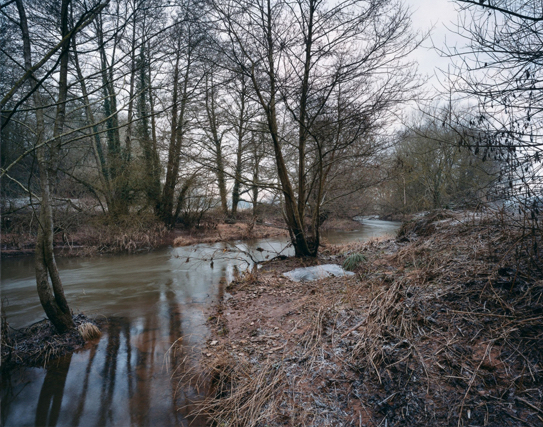 The River Winter (5), created some twenty years after The Red River, develops many of the same themes but by comparing the two series we can map the development, or perhaps it is better described as the refinement, of Southam’s voice. 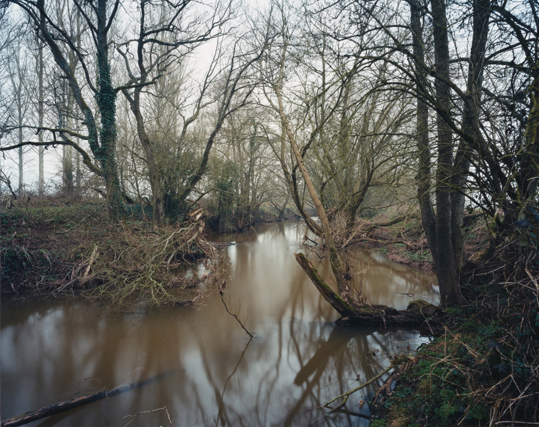 Andrew Nadolski highlights the way this series draws “on an almost medieval notion of the dark, deep winter.” (6) By studying a small river and a local landscape that both defines and responds to the river’s moods and movements, Southam asks how we see the countryside, what is a river and what is winter. The long term decrease in agricultural and land-based work, the shift to first industrial and then commercial employment and the resultant ruralisation of the population has isolated twenty-first century man from the natural world. Seasonal shifts in weather patterns are considered in terms of their impact on our movement in air conditioned transport between centrally heated homes and climate controlled commercial premises; once inside these artificial spaces we are cocooned from the direct impact of the weather. 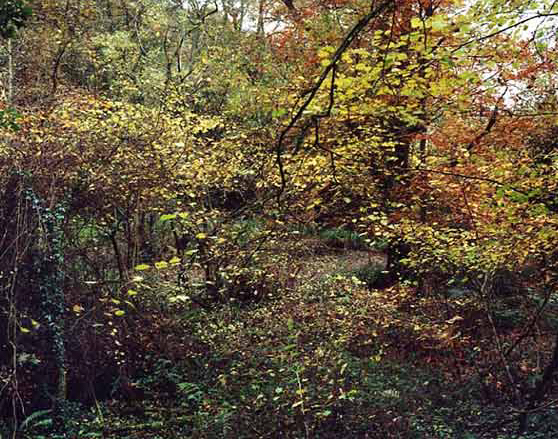 Few of us will visit the dark, damp, cold, grey and denuded winter landscape of a rural valley, preferring the warmth of towns and cities, the drama of snowy mountains or wild coastal vistas; if we visit the countryside at all in winter we continue to seek out the sublime or the picturesque and ignore the detail of a dormant land. As well as evoking the cultural memory of winter he also mines the myth of the forest, a subject he previously explored in The Painter’s Pool. 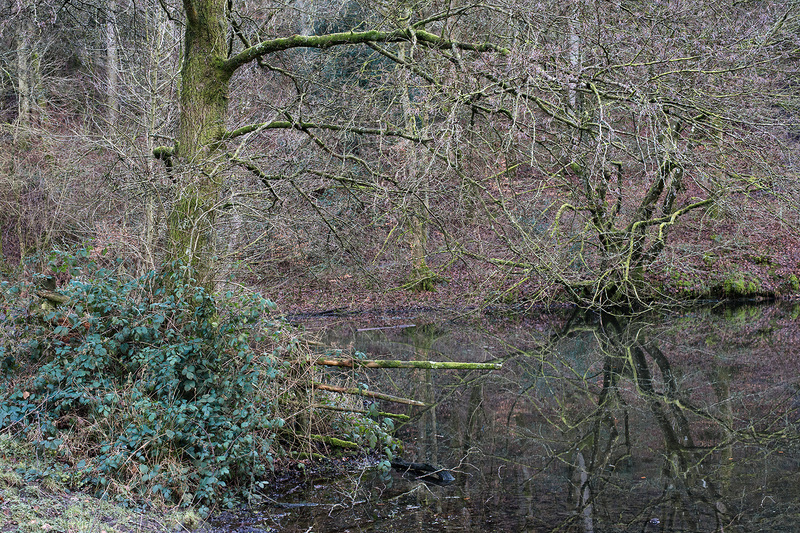 These two themes combine in an evocative way so that the dark waters of the Exe and its tributaries running beneath winter trees taps into our fear of cold icy water and dark living forests, places of mythical creatures and dark deeds. 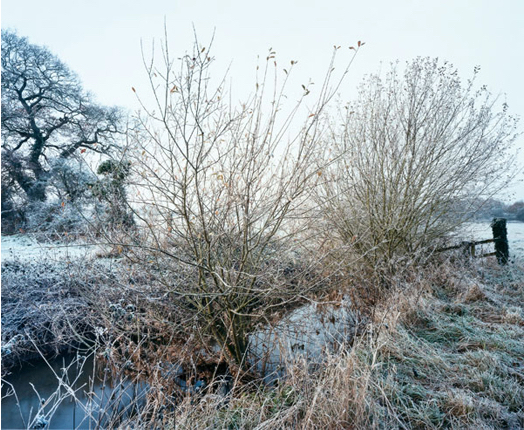 The Red River was organised as a chronology of many millennium, a sweeping historical view; The River Winter remains chronologically organised, it follows a single winter, but despite this comparatively brief timescale Southam continues to draw the history of this and any similar place into the pictures. There is a sense of timelessness, of the season’s cyclical changes being painted onto a canvas of an ancient river in an enduring landscape; it is the winter of 2010/11 and every previous winter seen on this river. The other overriding sense we gain from the series is that of a diary; a walk through the season, a re-animation of Southam’s progress along the banks of the Exe and its tributaries that winter. Hotshot Magazine describes his work as belonging “to a British tradition of close-looking and thoughtful study and reflection” (7) and this translates into the series being a very personal viewpoint bringing Southam into the pictures and underlining the sense of following in the photographer’s footsteps. The published series is not unique, Lee Friedlander recently published interpretation of the American West includes similar but monochrome studies (8), but the sheer complexity of many of the pictures refused the idea that the photographer’s role is to simplify complexity. In Painter’s Pool he represents the cycle of birth and decay; the balance between man’s intervention and neglect and of the visual diversity of tiny areas of wilderness that have survived or fought back against the deforestation of the land. In River Winter he returns to these same visual complexities but now the river is ever present in the background, slowly but remorselessly wending its way seaward behind the tangle of branches, twigs and dying or dead leaves. 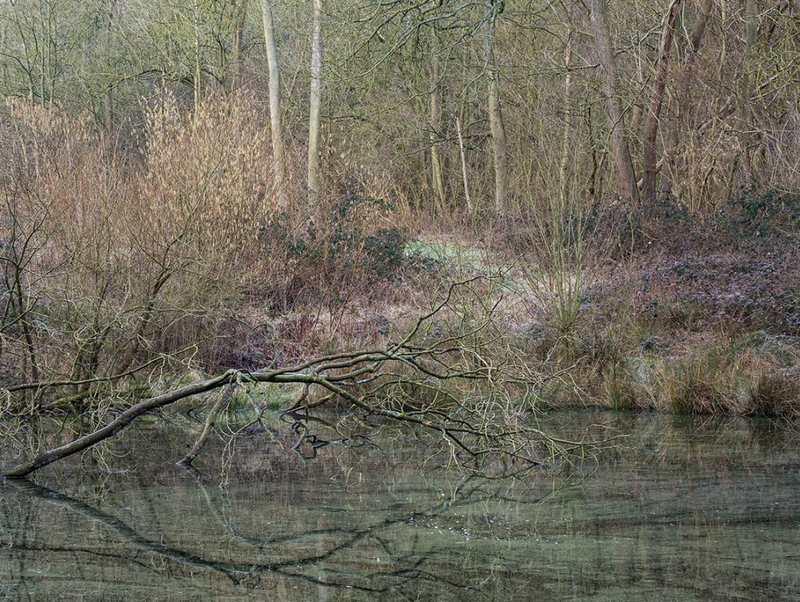 The resultant work is more topographical than Painter’s Pool, the river and the broader landscape offers more context to the forest but he continues to bring to our attention that it is in winter that the countryside is stripped bare and behind living nature and along side the ever moving river there is always stillness, death and decay. Everything about Southam’s work is contemplative, there is a stillness in his compositions that reflects the slow process of 10 x 8 photography and the premeditation of the photographer. In Italy there is a slow food movement that grew in response to the spread of American-style fast food outlets; towns and cities attempt to block what they see as a cultural invasion by burger bars and thick crust pizza stalls; Jem Southam promotes a slow photography movement, an alternative to the rapid, thoughtless and excessive capture of thoughtless images that digital photography has facilitated. He takes forty to fifty pictures a year (6) so the forty photographs in River Winter represent a full year’s output not an edited down selection of thousands of negatives; I find this idea humbling. We are very ready to describe photographers as inspirational without always being specific about what they inspired us to do. Southam taught me to look the other way, to ignore the obvious in the landscape that adds nothing to our overall knowledge of the land and to seek out the forgotten and ignored: the unintentional wildernesses we have created at major road junctions or on the verges of motorways and railways, the fringes of ancient forest that survive close to urbanisation or the land unintentionally preserved in an ancient state by the Ministry of Defence’s requisition of great swathes of Dorset, Wilshire and Norfolk for military training. (8) Friedlander, Lee (2016) Western Landscapes. New Haven: Yale University Art Gallery.